Description: The monument is a statue of Marquis de Lafayette standing tall with a sword at his side and a scroll of paper in his out-stretched hand. He stands with his right foot stepping forward on a stone pedestal that is covered with a bottom tier of roughly cut rocks and an upper tier of slate grey tiles. Sponsor: The Lafayette Society, led by Martha Duell, raised funds from private donations. Unveiling & Dedication: The monument was dedicated on the 200th anniversary of the naming of Fayetteville. Subject notes: Gilbert du Motier, Marquis de La Fayette, served as a major-general under George Washington in the Continental army during the Revolutionary War. He later was a leader of the Garde nationale during the French Revolution. 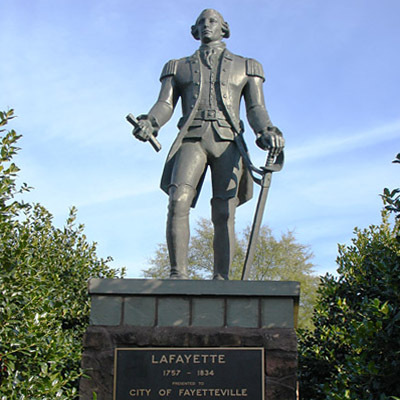 Fayetteville is the only city the Marquis actually visited that bears his name. Landscape: The monument stands in Cross Creek park and is surrounded by a circle of greenery.